Using the PDF viewer WordPress plugins is very easy but choosing a best one, way too difficult. When you go to a clothing shop, the shopkeeper puts so many dresses in front of you. After seeing all the dresses, there might come a moment when you’ll not be able to select even a single cloth. The reason is you like almost all of them but not all can afford to buy them all. That’s the same case with PDF viewer plugins. In the market, all of them have unique features & functionalities. But pricing plays a major role. Infact, every 8 plugins out of 10 are not free. So for those people, we’ve mentioned some of the best PDF viewer WordPress plugins. Every WordPress user who is in need of these plugins will surely get happy. With these plugins, they can download, upload & display the PDF files with ease. PDF Viewer For WordPress is PDF viewer plugin through which you can easily embed & display PDF files on the WordPress site. Using Google Analytics, you can track the visitors who read your PDF files. Regular: $17, one client/user, end users are not charged separately. Extended: $85, one user/client, end users can be charged separately. Social media sharing, fully customizable PDF viewer. Enable 7 disable print, download, option, social sharing, zoom, logo & many more. Create PDF files with no limitation on size. Install this plugin on your website without any 3rd party links. PDF & Print by BestWebSoft is a PDF viewer WordPress plugin. Through it, one can create PDF files & pages with attractive buttons & view the page in a new window. This plugin is completely compatible with both WordPress & WooCommerce. Annual: $30.98 with one year support & upgrades. Lifetime: $309.80 with upgrades & support for lifetime. Add PDF & Print buttons to posts, pages, search results automatically. Buttons can be added via shortcode. Download PDF & display it in next window. Create & add customized header & footer with texts, images, source page URL & many more. For certain posts & pages, one can disable PDF & Print. BSK PDF Manager by BannerSky is PDF viewer plugin for WordPress which lets you upload & display PDF files/document on the site. One can create multiple categories & upload the PDF files in those categories. After doing it, they can display it in a category with the help of either a widget or a shortcode. Personal: $0, output PDFs, custom order, show PDF link, date, custom link text & many more. Professional: $25, unlimited site license, 1 year of improvement, updates & plugin support & many more. Category- add, edit & delete. In multi-column layout, display PDFs. Show PDFs with ID widget, automatically upgrade. Add a featured image with proper title & manage its size. Order PDF files by date, title, filename or by the customized order. PDF Embedder Premium is a WordPress PDF embedder plugin which provides a stylish & dynamic viewer for the website’s visitors. This plugin is responsive to both desktops & mobile devices. ‘Download PDF’ button allows the users to acquire the PDF file to read according to the choice of viewer. Track number of downloads and views. Hyperlinks with full functioning capability. By typing the page number, you can reach the desired page. 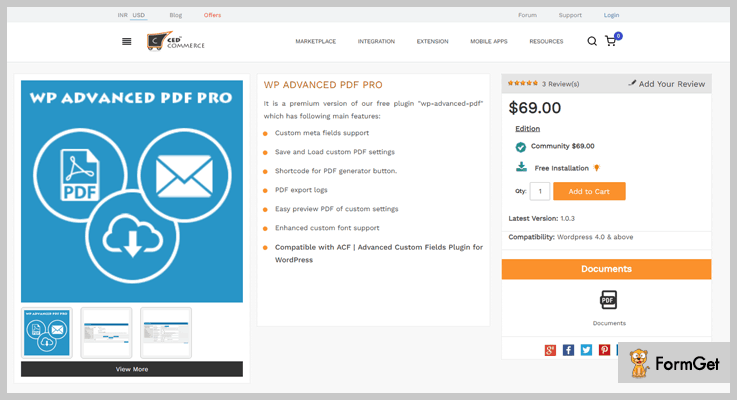 WP Advanced PDF is an Advanced Custom Fields plugin in WordPress plugin by CedCommerce with multiple advanced features for pdf generation. The plugin provides email mode (guest users) and direct download mode for pdf generation. This feature of the plugin gives the reader the feeling of going through a real document. Based on the requirement it is easy to add watermark, customized styling, insert brand logo, deciding the visibility of post based on its type and much more. The plugin can be availed at just $69, with 24*7 FREE support and no hidden charges. PDF generated is ready for translation. Post styling can be customized to make it user-friendly. Despite the advanced feature, it is remarkably easy to use. Different accessibility levels for the guest and registered users. Log maintenance of PDF exported. Light of server memory due to the cached PDF feature. WordPress PDF Viewer and Embed Plugin is used to embed the shortcode with any page to display a full screen-readable PDF document. Either you can upload the PDF file from the desktop or import it by using PDF URL. Regular: $16, one user, no charge to end users. Extended: $95, 1 user, end users can be charged. PDF viewer with two display modes: embed & full screen. Compatible with browsers like Google Chrome, Mozilla Firefox, Latest version, Safari, IE etc. Shortcode to generate buttons on PDF files. Printing the PDF file by the user is optional. The admin can enable & disable the printing option anytime. Using share option, the user can share the PDF file on Pinterest, LinkedIn, Twitter, Facebook & on many more social media platforms. PDF Light Viewer PRO Addon is one of the most affordable plugins in the market of PDF viewer WordPress plugins. You can add unlimited PDF files with limitless file size on your page through it. Regular: $16, one client, no charge to end users. Extended: $60, 1 client, end users may be charged. Integrated with turn.js flipbook, slider thumbnails navigation & lazy loading pages. By using .po files, pages are fully translatable to any language. Attractive pages with the zoom feature. SEO friendly mode for the texts in the PDF files. Embed Any Document by Awsm Innovations is used to upload & embed any type of document on the WordPress site. This plugin is one of the best in free PDF viewer WordPress plugins. It doesn’t need any third party plugins such as Acrobat & Flash Reader. To display any document, Google Docs Viewer & Microsoft Office Online can be used. This plugin is free of cost. Quick uploading & embedding of the document just by clicking ‘add document’ on the interface. Microsoft Office Online services & Google Docs Viewer are used to display the documents. Files type support: docx, docm, dotm, dotx, pdf, pptx, ppsx, ppt, pps, pptm, potm, ppam & many more. Responsive to all types of browsers & mobile phones. Embedding the document comes with a clutter-free & clean UI. Interactive 3D FlipBook is a PDF viewer WordPress Plugin which grants to browse PDFs, images or HTML like a flipping book. For demonstration magazines, cards, books & many more, it can be used. Apart from it, it has a very nice interface to which every user will be attracted. It doesn’t charge any amount for using it. Flipping animation while changing pages. Effective algorithm to display the book (PDF & Image files) in a comfortable according to the interface. Prediction of user’s behavior by tracking the user’s actions. Multiple skins for dark & light themes. Above are some of the best PDF viewer WordPress plugins which any WordPress user can add to the page & display PDF files with ease. Some of them are free & others are paid. So we’d like you to try out these plugins such that you & your visitors will easily be able to perform any kind of operations on it. If you have any suggestions & queries, please comment below & we’ll get back to you shortly. We do value our blog readers!